Remote control (RC) sailboats are great fun for lakes, pools, and ponds! Get full control with the included remote control. Motors power the sailboat as well as the wind. That means no more getting stuck in the middle of the water with no wind. 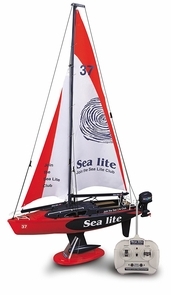 Each sailboat comes with a really cool remote control that is easy to use for beginners to experts. Remote control (RC) sailboats are a big hit with people of all ages and are great for all experience levels. This awesome sailing yacht provides fast and smooth sailing as you can see in the video below. This boat is detailed and extremely realistic. The Boat is powered by a motor and is a Vector-Push design, which is extremely easy to be controlled. Designed for pools, ponds, and small lakes. Venture out on a sunny day and enjoy hours of fun sailing this ship across a lake, then place it up on the mantel for fabulous nautical decor. Fully Functional remote control ship with dual motors and propellers High quality remote control with a range up to 25 meters. Recommended for Age 6 & up. Searching for a different style or model of radio control boat or toy? Browse our full line of remote control boats and motorized pool toys.